Last page. Whew. Okay guys. I actually drew and colored these pages nearly a full calendar year ago, back when I was pitching this story as a graphic novel. It didn’t get picked up, but I still want to draw it, so here we are. Here’s the deal: I really like this story and these characters, however I have another big cool thing that’s under wraps still so I can’t really talk about it but do know that I am working very hard on that. But because of that, this story has been put on the back burner yet again. 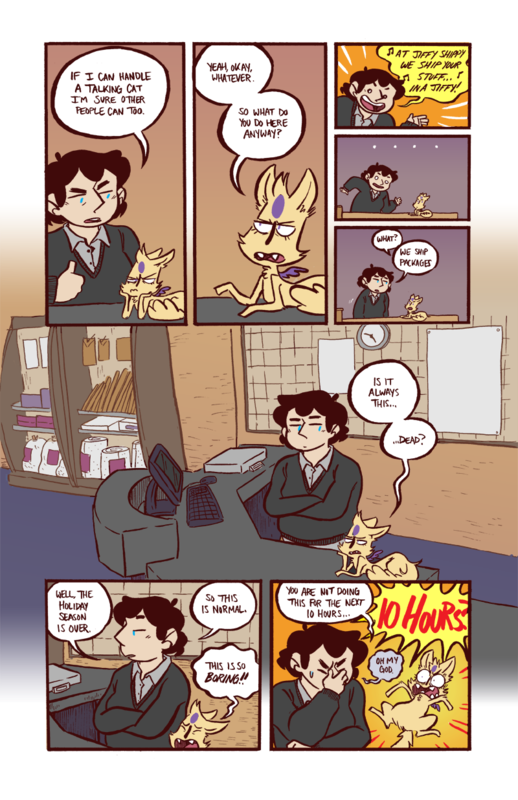 Ideally, I’d only post four or five updates to this comic (since the format it’s written in splits it up into seasons) but I don’t think that’s entirely feasible. This comic is totally outlined and the first 20-ish pages are written, I’m just still deciding on how I best want to present it. 20ish page chunks? Completely write the comic first and then pick at pages when I can? I don’t want to start it unless I know I can finish it, and I’m still figuring out how best to go about doing it. This is a lot of rambling basically to say: I have no idea when I’m going to update next. I wish I had a better answer to this! I have a lot of cool things in the works, but nothing I can really put up here. Sorry guys. I don’t wanna abandon things, but things are probably going to continue to be quiet for a while longer. To keep up with things, I suggest following my twitter (@sgoetter) since that’s the main thing I update anymore.